Put out food for hedgehogs in the garden and they will eat it! The hedgehog’s natural diet mainly consists of slugs, ground beetles, caterpillars and worms. During cold or dry periods, these creepy-crawlies become much scarcer in gardens, so hedgehogs will benefit hugely from a shallow dish of water and supplementary feeding at these times. What Should I Feed Hedgehogs? It’s important to remember that this food is only supplementary to their natural diet, so please be sure to provide a nice mixture of food to get all the nutrients that they need. Place in a shallow dish and put in a sheltered area of your garden around sunset. 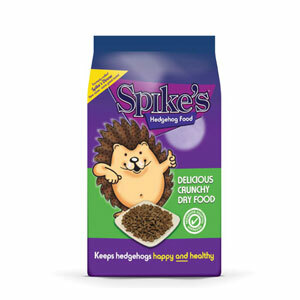 Specially made hedgehog foods both in dry and moist kibble varieties now exist and can be bought from most local pet and garden stores. Hedgehogs will also relish any combination of meat-based wet dog or cat foods as these are high in the protein that they need. Just remember, they will be getting most of their food from insects and worms in the wild, and this food is only supplementary. Can You Feed Hedgehogs Bread and Milk? Hedgehogs are lactose intolerant so please do not give them milk. Bread is low in energy so fairly worthless to them. Should I Feed My Hedgehogs Mealworms? Hedgehogs love mealworms, but they don’t offer all that much nutrition. To find out more about feeding mealworms click here. How Can I Stop Cats and Foxes Eating It All? Be aware that putting any food out will attract all sorts of wildlife and not just hedgehogs, this includes predators. To avoid the food you put out being eaten by pets or foxes you could make a feeding station that is difficult for anything larger than a hedgehog to access. You could use a piece of piping, or build a shelter out of bricks and paving stones or get some inspriation from a nifty solution by Hedgehog Champions below. Should I Clean my Feeding Station? Hedgehogs are solitary animals generally. By putting food out, you are more likely to attract several hedgehogs. As they share food from the same feeding station, its possible that they could spread disease between one another. It could also be a risk that they spread disease to us, so to be extra safe regularly clean your feeding bowls and do not wash them with your own plates and bowls. For more hedgehog and disease advice visit the Garden Wildlife Health project website and download their helpful fact sheets. How do you encourage natural hedgehog food in the garden?